(DVD + CD set) Another of the fabulous Goossens efforts conducting the London Symphony Orchestra in a rousing performance of this Berlioz masterpiece. This Bert Whyte recording is from Walthamstow Assembly Hall in London – the same hall used extensively by Decca and Kenneth Wilkinson. 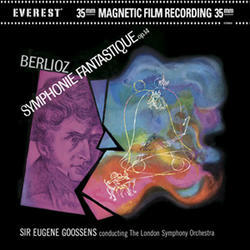 The performance, full of imaginative and brilliant orchestral sounds is wonderfully complemented by the 35mm sound which has a textural richness that is more realistic than any other tape format. Includes a bonus CD remastered. HDAD Plus is a 2-sided hybrid disc that will play in 24/96kHz on a standard DVD video player (no footage included) and in 24/192kHz on a DVD audio player.